Passenger list of Isak, Lisa Bretha (Norstrom), Isak, Amanda, and Herman Bajala on arrival in Quebec, Canada on June 19, 1871. They departed Liverpool, England on June 8, 1871 and stopped in Londonberry, Ireland on June 9, 1871. The ship was the S/S Austrian of the Montreal Ocean Steamship Company. They are Item #1155 on the list. Passenger list of Nils, Marie Helene (Norstrom) and John Bergman on arrival in Quebec, Canada on August 19, 1868. 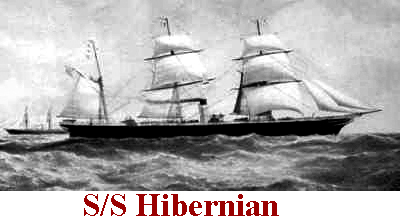 They departed Liverpool, England on August 7, 1868 and stopped in Glasgow, Scotland, as well as Dublin and Kingstown Ireland on the way to Quebec. The ship was the S/S Damascus of the Montreal Ocean Steamship Company. They are Item #276 on the list. Land plot shows George Kipp Sr owning 30 acres, and his son J (John) Kipp owning 19 acres just east of his property. Original Warrant, applied for by Francis Beaty, for the land which was later warranted and patented to Henry Kipp. Map from 1911 showing location of land of John W. Kipp in Allison Township, Iowa (North of Lester). ID Badge while she was a welder at a ship yard during WW II.